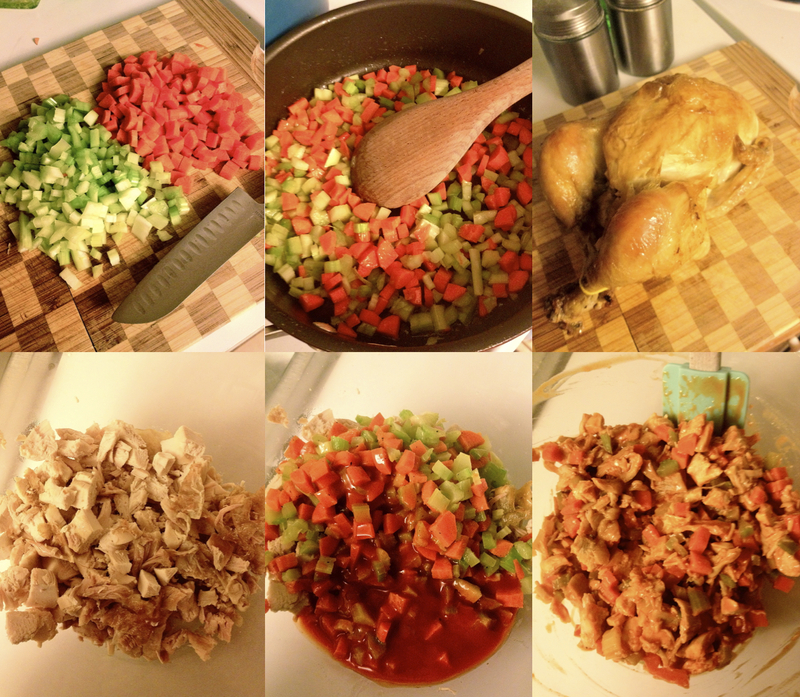 I had almost totally forgotten about this recipe until the other day… and I am glad that I remembered it! 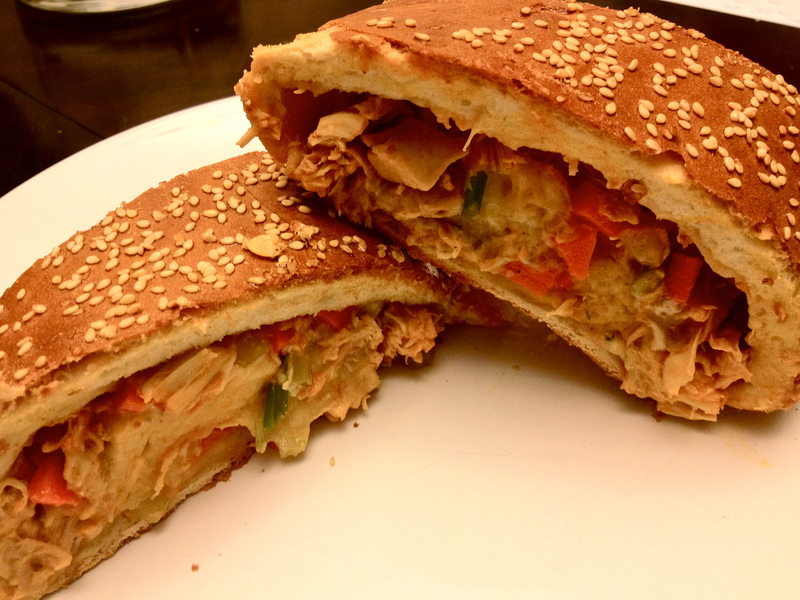 Chicken drenched in Buffalo sauce, blue cheese, carrots and celery… this stromboli is jam packed with everything you need for a chicken wing platter stuffed into a delicious doughy stromboli. Baked until warm and bubbly, it’s perfection right out of the oven but is also just as amazing at room temperature… which makes it great if you need to bring a dish to pass somewhere. Preheat your oven to 400 degrees. Heat 1 tbsp olive oil and 2 tbsp salted butter over medium high heat in a skillet. Peel and chop 3 small carrots and wash and chop 4 stalks of celery. Add the vegetables to the skillet and cook until softened, about 4 minutes. Take 2 cups chopped chicken (either from a chicken you roast or one from the store) and cube up about 2 cups of the meat, put into a large bowl. Add the vegetables and 1/2 cup buffalo wing sauce (or hot sauce) and mix together until everything is coated well. While the filling is cooling, cut 3 scallions on a diagonal and grate 1/2 cup monterey jack cheese. 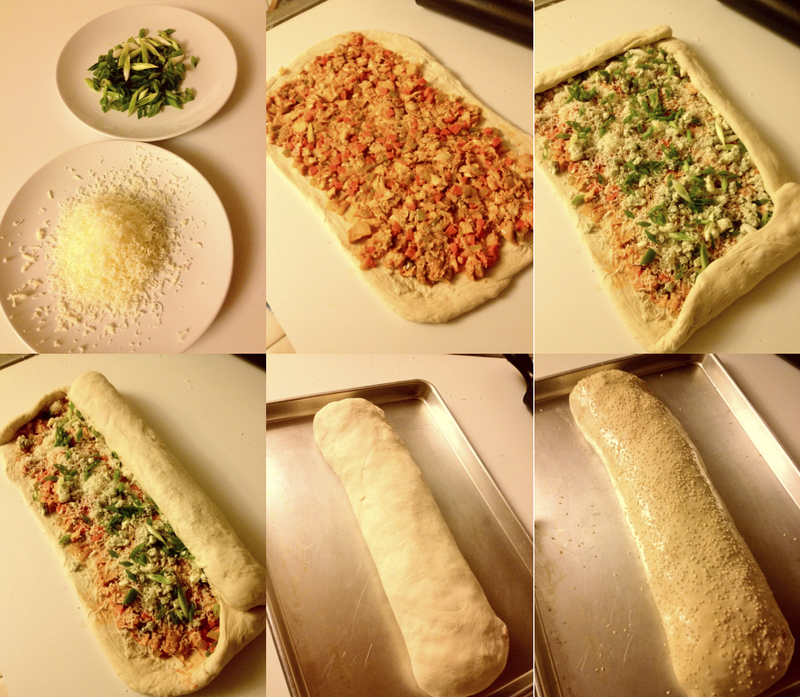 Roll one pizza dough out into a rectangle and spread the chicken mixture on top, leaving about a one inch border all the way around. Top with both cheeses and the scallions. Starting with one of the long sides, start rolling up the stromboli and tuck in the ends. Roll until the whole thing is in a roll and pinch the seam with your fingers to seal. Move the stromboli to a baking sheet, brush with one beaten egg and sprinkle with sesame seeds. Bake for about 40 minutes until golden brown and then cut into slices. This recipe serves 4. It seems delicius!! I’ll try to do it with some pepper!